When you choose Report> transactions and then select Customer ordered short fall report , the transaction report like the one below will be produced. This report is used only for sales to customers. 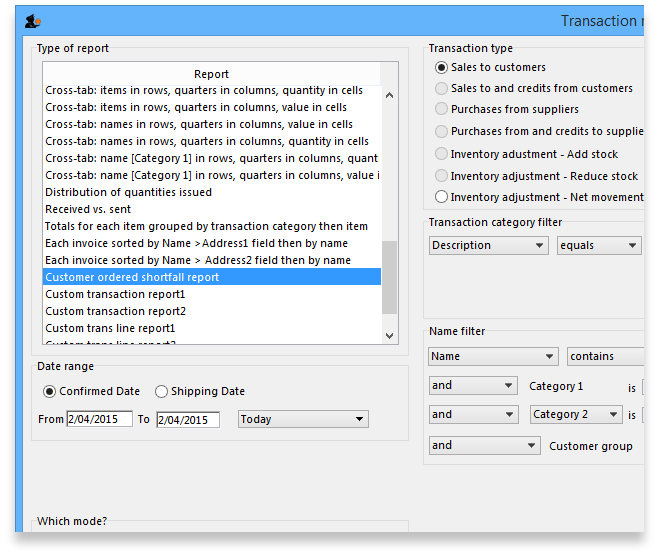 From the report window, select the desired parameters and click OK . An example report is shown below. Choose File > Preferences > Invoices2 and ensure “Delete placeholder lines when confirming invoices” is not checked. Staff must enter requested amounts on invoices as placeholder lines. For example, a customer orders 1000 x Paracetamol syrup 60ml. You have 800 in stock, so you add 800 to the invoice, and you also add a placeholder line for 200 bottles. You need to decide whether to (and if yes, how) to use the backorder system. If customers can rely on you to record shortfalls as backorders, then they will no need to re-order the shortfall in subsequent ordering cycles, as they know you will deliver it when available.